Students should not be surprised about what they are expected to know and be able to do on an exam. As you prepare the summative assessment or final exam for your course, consider ways you can help your students review effectively and then use exam time efficiently. The outline below is designed to guide the final week of class time and the student review time at home. Here’s Prep for Exam handout. Note the instructions for each section are laid out in the handout in much the way this information appears in test prep resources for the SAT and ACT exams students take. 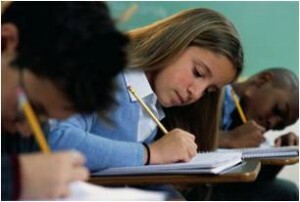 A. Recognizing Verbals and Verbal Phrases – (5 points) Identify the underlined the verbals in the following sentences. On your Scantron, mark A for participial, B for gerund C for infinitive. B. Correct Use of Modifiers – – (5 points) On your Scantron, mark A if the sentence is correct B if it is sentence is incorrect. C. Recognizing Dangling Modifiers – (5 points) On your Scantron, mark A if the underlined modifier is dangling or misplaced B if the underlined modifier is in a logical or correct place. IV. WRITING ABOUT LITERATURE (50 minutes) – You may use one page of notes with facts about the stories. Remaining 10 minutes should be used to reread and edit your two essays.